Most people love Cynthia Bailey. Well, she never really did anything for people to “dislike” her, but she wasn’t out there offending the viewers either. That was until the Real Housewives of Atlanta Season 11 finale episode. She made some very suspect comments insinuating that she was a part of a scheme to bring Kenya Moore back to the show. Other than that, Cynthia has just coasted for years. In contrast, Friend of the Housewives Marlo Hampton always brings the drama. She is beyond shady. She has no problem spilling the tea. Plus, she has some interesting fashion choice. So why isn’t she a full-time cast member? 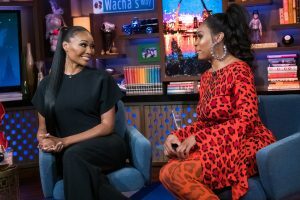 In an interview with Ebony, Cynthia discussed Marlo’s contributions to the show. After a very long “ummmm,” Cynthia said, “I think Marlo definitely brings her fashions to the show. That’s her whole thing. You know that’s what she loves and I think it’s great to have somebody who’s really into fashion on the show.” If I have to hear another outfit critique in place of an actual storyline…. Then Cynthia got into the good stuff. She said, “I think she definitely became the bone collector of the season. She definitely stirred the pot.” Marlo always comes through in that way. Unlike some full-time cast members who just phone it in, spending more time promoting products and picking out their next statement wig than contributing entertaining storylines. Is Marlo not willing to do that? Or did she just never get the opportunity? Let’s take things up a notch and give Marlo a peach. Maybe she will unravel some of the mystery. TELL US- WHAT DO YOU THINK ABOUT CYNTHIA’S COMMENTS? SHOULD MARLO BE A FULL-TIME CAST MEMBER?